Former Trump Aide Fabricates Nate Silver Quote - Joe.My.God. 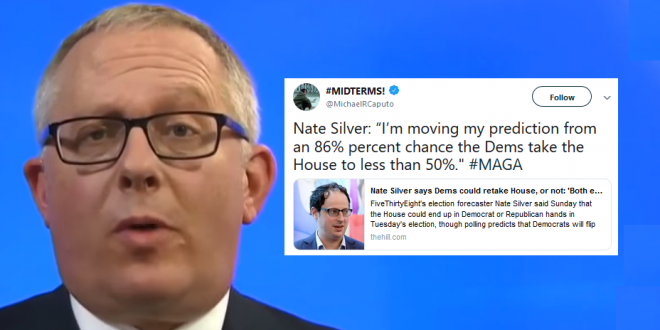 Former Trump aide and Fox News regular Michael Caputo this afternoon tweeted a laughable lie, fabricating a Nate Silver quote that appears nowhere in the article he linked. Caputo moved to Russia in 1994 after the fall of the Soviet Union, and was an adviser to Boris Yeltsin and helped elect Yeltsin to a second term as President of Russia. He worked for Gazprom Media in 2000 where he helped improve the image of Vladimir Putin in the U.S. He moved back to the U.S. and founded a public relations company, and then moved to Ukraine to work on a candidate’s campaign for parliament. Caputo worked as the campaign manager for Carl Paladino in his 2010 bid for Governor of New York. In 2016, Caputo joined the Donald Trump campaign, and was put in charge of communications for New York. He left the campaign after publicly voicing his approval for the replacement of campaign manager Corey Lewandowski with Paul Manafort. Caputo was investigated by the United States House Permanent Select Committee on Intelligence as part of their investigation into Russian interference in the 2016 US presidential election. In May 2016, Caputo and Roger Stone met with Henry Greenberg, a Russian national who claimed to have damaging information about Hillary Clinton. Last year Caputo whined that due his legal fees resulting from the Russia investigation, his children would be “going to community college.” Womp womp.